Come celebrate your child’s special day in a space of inspiration and fun! Our party package starts at $250, which includes two hours of fun for up to 15 children, plus eco-conscious decorations, supplies for an Earth-friendly and engaging project-based activity led by our staff, and compostable tableware for serving your refreshments. Party guests will also have access to our hands-on, educational exhibits. Parties can be extended and customized to meet each party’s needs as you select from our long list of activity choices, just contact our fun staff at parties@matteroftrust.org to find out more! All themes are customizable based upon age, gender, and interest. Our party specialists will work with you directly to plan a party that matches you or your child’s personality. Frolic about as we get our hands dirty, ‘green’ up the room, and create the beginnings of an urban garden for each participant to take home. 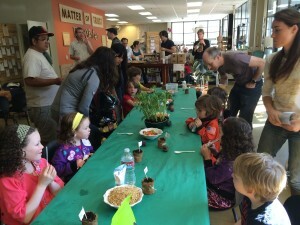 Parties can make their own edible soil cups, biodegradable origami planters, seed bombs, or vermacompost! Have a fun, all-natural pampering party! Your party guests will mix up luxurious spa treatments from our natural ingredients. Experience self-created face scrubs and masks or make your own, chemical-free beauty products to take home, picking from lip balm, signature scent, or bath salts. Just a warning, peaceful relaxation might not be possible with all the laughter, chit-chat, and style advice, but their bodies will thank them for a chemical-free spa experience! Our staff will lead party guests through the fun ‘building’ process of taking, fabrics, corks, popsicle sticks, book bindings, egg cartons, films strips, and more, and transforming them into an eco-model house, fort or playground the perfect size for your doll friends! Recycling has never been this fun, or produced such beautiful results! Our man-made surplus expert will guide party guests on the journey from trash to treasure. You won’t believe what you can make! Choose from items such as cork boards, scratch-art CD’s, hand-made doll pillows, pistachio florets bottle cap art, button jewelry, superhero capes and masks, robot creations, or journals. Music matters! Party guests will learn how to use repurposed items to make a variety of musical instruments such as rain-sticks, shakers, pipe flutes, whistles, click clacks, glovaphone, straw horns and then have a performance parade! $250 for two hour birthday party. One and a half hour is staff-led activity time which typically is time for two separate activities. Parent or Host has 30 minutes for food, cake and presents! Extra time, or extra activities can be accommodated for an additional fee. For more information and to book your party, please contact parties@matteroftrust.org or call 415-252-1177. Our Center is conveniently located one block from the 16th Street BART station, and along many city bus routes. Plenty of metered parking is available on 17th or on Hoff. There is also a large parking garage on Hoff between 16th and 17th. Instead of blue or pink, honor the mom-to-be with a green themed baby shower! By hosting your baby shower here you not only receive the inspirational space and access to our exhibits for two hours, but also eco-conscious decorations, supplies for an Earth-friendly game or craft project, and compostable tableware for serving your refreshments. We’ve got lots of fun craft ideas to choose from, all resulting in take-home goodies for the baby on the way or party guests themselves! Contact our party specialists today to talk about options for customizing your unique shower. For more information and to book your party, please contact parties@matteroftrust.org or call 415-252-1177. 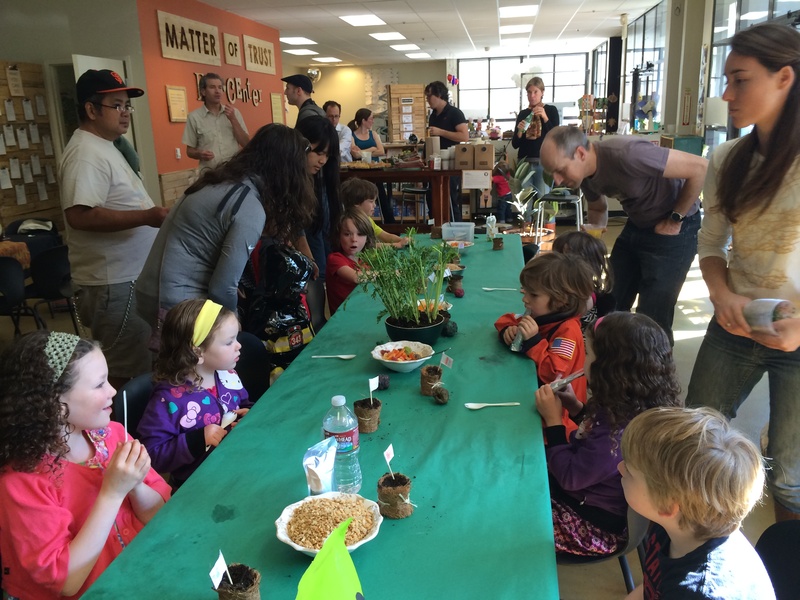 Our Eco-center is conveniently located one block from the 16th Street BART station, and along many city bus routes. After your event, please fill out our survey. Completed feedback forms help us improve our programs and get support for the eco-center from foundations. 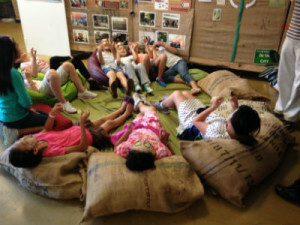 How did you feel about the booking experience of your child’s B’Earthday party? How would you rate your personal experience during your child’s B’Earthday party? How would you rate your child’s experience of their B’Earthday party? How would you rate the staff member that hosted the party? Do you feel as though the time-frame was appropriate? Were you satisfied with how the space was used at the Matter of Trust Eco-Center? 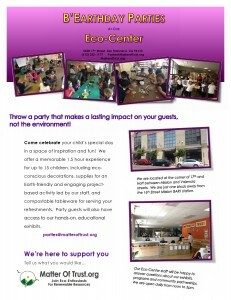 Would you recommend having a B'Earthday party at the Matter of Trust Eco-Center to friends or family?